If you want to change your look, a wig can give it to you in an instant! Come and try our monochrylic fibre fashion wigs at Clinic 36 in Darlington; wigs that are as good as real hair – and certainly less troublesome! Want to be blonde? Want to be brunette? Want to be a redhead? Come and try our sensational styled fashion wigs and see what a difference they make to you. Blonde wigs, brunette wigs, redhead wigs – now you can get the look you want without expensive hair treatments. Our range of fashion wigs gives you a new look – instantly! And there’s a wide range of choices available. Clip-in hair extensions by Beauty Works are great if you are looking for a more glamorous look. The extensions are created using real human hair for a natural look and give instant results. To find out more contact us here. Don’t want to buy online? 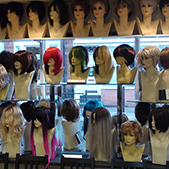 Then why not arrange a free, private, no obligation wig consultation with one of our wig specialists? In this free, 1:1 confidential consultation you can take the advice from one of our wig consultants and they can help you make the right choice for the best wig for you.